HENRY AH YIN KAU AKI November 25, 1924 - May 6, 2015 Henry Ah Yin Kau Aki, 90, of Lana'i City, passed away at Straub Hospital, Honolulu, on May 6, 2015. He was born in Lahaina, Maui at the Haia Kekai family home on Wainee and Dickenson Streets. Growing up in Lahaina, Henry attended Kamehameha III and Lahainaluna High Schools. He is a veteran of the U.S. Army and served in the World War II South Pacific Campaign. Henry possessed many talents. He loved music and played multiple instruments including the sousaphone, ukulele and guitar; slack key was one of his favorites. In his youth, he won first place at the State Interlocken Music Contest for Maui Island, and also sang with the Na Leo Lani O Maui Choir for several years. 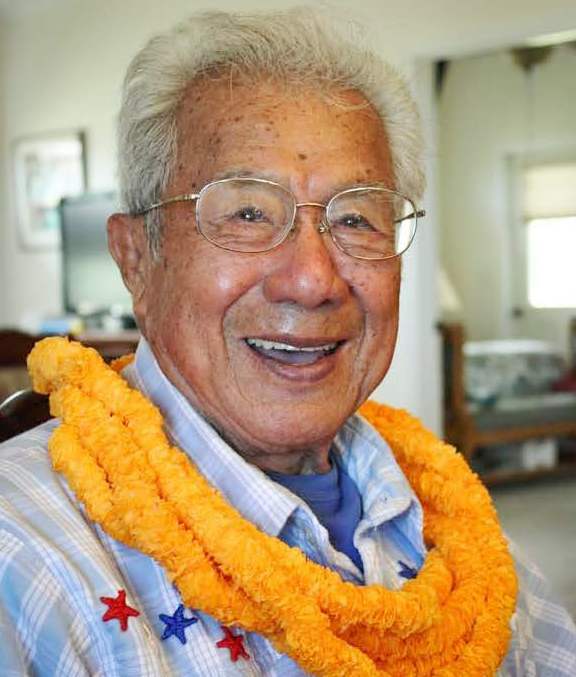 In addition to the choir he was an avid gardener, master lei maker, known for his beautiful Ilima lei and pheasant feather lei, an avid horseman, master free diver and sportsman of all sorts. Henry was often seen in parades with his beautiful Palomino horses and his own handcrafted Hawaiian Saddles. He is also one of the founders of the Lana'i Horse Owners Association and served as the President for the Lana'i Hawaiian Civic Club. A Maui News front page editorial in July 2006 called Henry Aki, a true "renaissance man". Henry worked at Dole Company's Lana'i Plantation for 45 years, before retiring in 1986. He began driving mules across the Lana'i pineapple fields and also was a diver at Kaumalapau Harbor. He would later become Harbor Master and oversee all shipping operations on the island. He lived a full life. He is survived by his best friend and lifetime companion: Lani Scott, daughters Penny Wilna Kalua Speer, Renette Haunani Mei Ling Aki-Kamai, Henriette Mei Lani Aki, Joelle Mei Lianne Aki (Alton) Aoki and has two hanai daughters: Dawn Amber Edelstein (Chris) Miura, and Sunica Tyler Edelstein, ten grandchildren and a great-granddaughter. Services to be held on Friday, June 5, 2015, at Borthwick Mortuary Maunakea Chapel, 1330 Maunakea Street, Honolulu, HI 96817. Visitation will begin at 10:00 am and service to follow at 11:00 am. Neighbor Island services: Maui: Thursday, June 25, 2015, Waiola Church, 535 Wainee St., Lahaina, HI 96761. Visitation: 10:00 a.m., Service: 11:00 a.m. Lana'i: Saturday, June 27, Trilogy Pavilion, Manele Bay Harbor, Lana'i, HI, 96763. Visitation: 9:00 a.m., Service 10:00 a.m. Scattering of ashes to follow.